Discussion in 'PlayStation Vita Games' started by JamesStill, Jan 23, 2019. Interesting as the original version was just Japanese and Chinese, but this version includes Korean. I wonder if there's any chance it'll include English as well. Did PQube do their own translation, or was it done by the original developers? PQube was handling their own translation, as far as anyone knows. PQube does translation more often, so I am pretty sure they handled this as well. If I could read Korean it would be really awesome right about now. Tweeg and zodaex like this. On that note, Eastasia Soft (PA's partner in PA exclusives) said they're not touching the game because of all the drama with it. "Touching" huh? I see what they did there! zodaex and TheAtom like this. So is there any othee difference between this release and the one released last year? 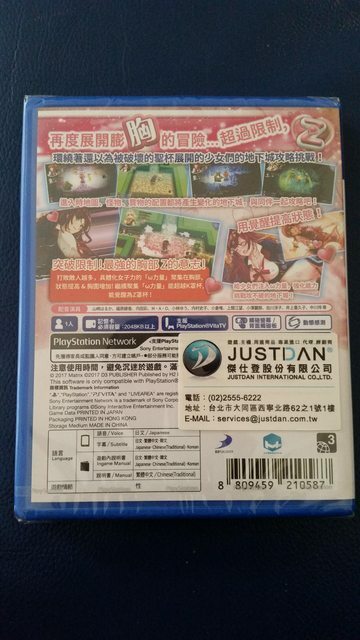 I asked one of my friends living in HK sent me a photo of his PSV copy and it also has Korean subtitles included in. I presume this is a re-release but cheaper. I might check it out when it releases next month. Yeah it appears to just be a case of Play Asia neglecting to mention that the original Asian release already had Korean subtitles. They've done that many times in the past.